One size - 56cm (22in) in circumference, and 23cm (9in) in height. 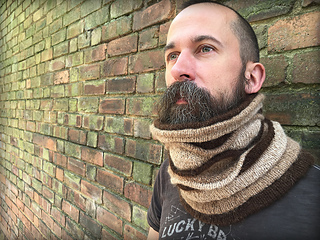 The World of Welt Cowl, as the name suggests, uses welts to create texture and structure. 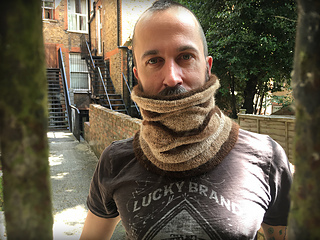 As a result, the cowl sits really well around your neck, standing tall, instead of sitting flat around your shoulders the way many cowls will. It’s thick, squishy, and incredibly cosy—perfect, in fact, for any cold day, but be warned: you might never want to take it off! Why “World of Welt”? 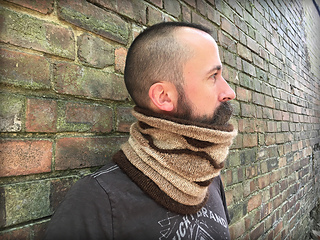 Well, obviously, the cowl features a variety of welts of different thicknesses, creating its unique character, but also, “Welt” is the German word for “world”, and because of the use of German short rows for all of the shaping, the bilingual pun seemed too good to resist! Using three colours, the curves and waves of the design create undulating hills and troughs that wind their way sinuously and continuously around the cowl. Choose three complimenting shades of the same colour, or go wild with eye-popping combinations to create a truly unique cowl that you will LOVE wearing. 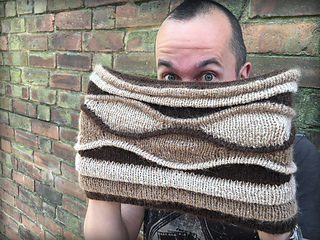 As I mentioned, all the shaping of the hills and troughs is created using German short rows (or GSRs), which are super easy to perform, and really effective—no more wraps and turns! You can either work them the traditional way, which involves turning the work during the GSR manoeuvre, and purling back across the wrong side (inside) of the work, OR you can be a bit more savvy than that: it’s perfectly possible to work GSRs without turning the work, and with a little technique called Knitting Back Backwards (KBB), you can keep the right side of the work facing you all the time, never having to worry about turning, or purling! All the techniques contained in the pattern have either photo tutorials or links to video tutorials. The video links even include QR Codes that you can scan directly from the printed page if you work from paper, rather than off a screen! Essentially, everything you could possible need is right here! The pattern calls for three different colours of aran-weight yarn. (There will be a matching hat pattern coming soon, for using up the remainder of the skeins, so hold onto them!) 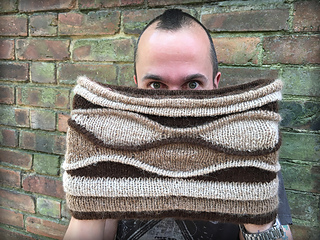 I used the Alpaca Tweed yarn from The Border Mills for mine, and it really is the most luxurious cowl I’ve ever come across. 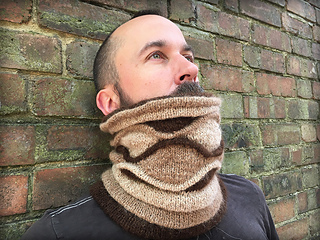 The structure of the cowl makes it stand up around your neck, rather than drape across your shoulders, and that, combined with the sumptuous alpaca yarn, creates a cowl that is more like a hug than an item of clothing!